When replacing a traditional TDM PBX with Skype for Business, one of the most common feature that users requests is, the group call pickup. In Microsoft Unified Communications platform, group call pickup was introduced in early Lync Server 2013 days. It was configured initially by using the Secondary Feature Activation Utility or (SEFA Util). SEFA Util was an add-on tool that needed to be configured on top of Lync server platform. Managing group pickup using the tool was not so user friendly. In Skype for Business, Group pickup was included in to the existing Call Park feature. The pickup number for a group will be created as a one of the numbers that belongs to a parking orbit. Below command need to be run on Skype for Business Front End server to configure a call park orbit, to be used for Pickup groups. Above user can now be able to pick each others calls by dialing *200 from Skype for Business client or IP Phone. Looking at a soft key configuration within a Polycom VVX, it would require a Provisioning Server to manipulate the device configuration. Sometimes back, i wrote an article about setting up a Provisioning server for VVX. The same process can be used to configure soft keys for devices. In SoftKeys, configure either the Softkey.1 or Softkey.2 options. In my case, the Softkey.1 was used for some other feature. Configure the key as shown below in snapshot. Once it’s configured, the “Pickup” key will appear in Soft Key 1 position of the device. Once pressed, it will call *200, which is the ID to pickup calls. 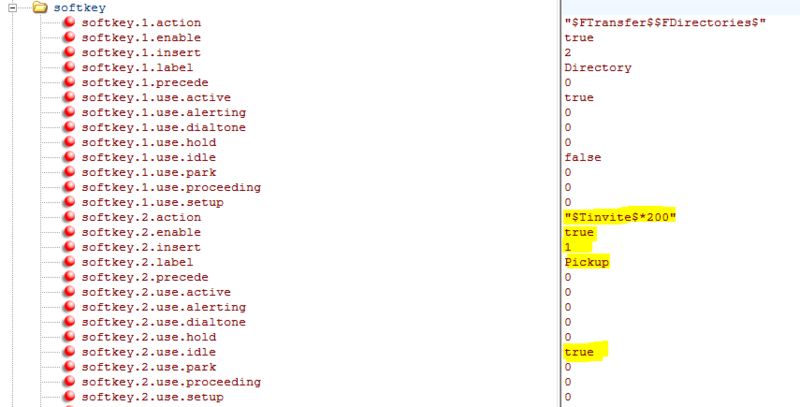 If this device\user is belongs to a pickup group and assign with *200 ID, then the device can pick calls that are meant for others within the group. The downside of the configuration is that, Provisioning server will push the same ID to all devices and all devices might not belongs to the same pickup group. The way around is to have unique configuration files based on the MAC address of the device, instead f using 000000000000.cfg file. This will allow the devices to have different configuration file. But, it becomes difficult when there are lot of endpoints and lot of groups. This will work very well for a small scale deployment. Try it out and post and comments or issues below. Thanks.